SIUE’s Kathy Mora, PhD, RD, assistant professor of nutrition, and her Undergraduate Research and Creative Activities student Allison Lutz shared a glimpse into their research on Show Me St. Louis Thursday, March 21. 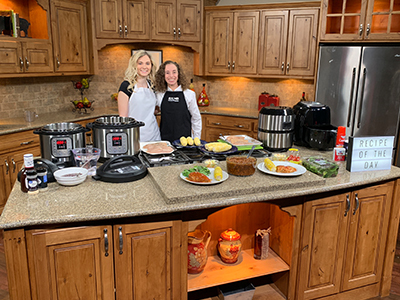 The two are researching the versatility and effectiveness of two popular pieces of cooking equipment: the air fryer and the Instant Pot. They shared a recipe for BBQ chicken by demonstrating how it could be prepared in each appliance. View the segment here.